This is a quick one and goes out to all my snowed-in Northeastern brethren whose color palette for the past few days has been white, gray, dark gray and darker gray. 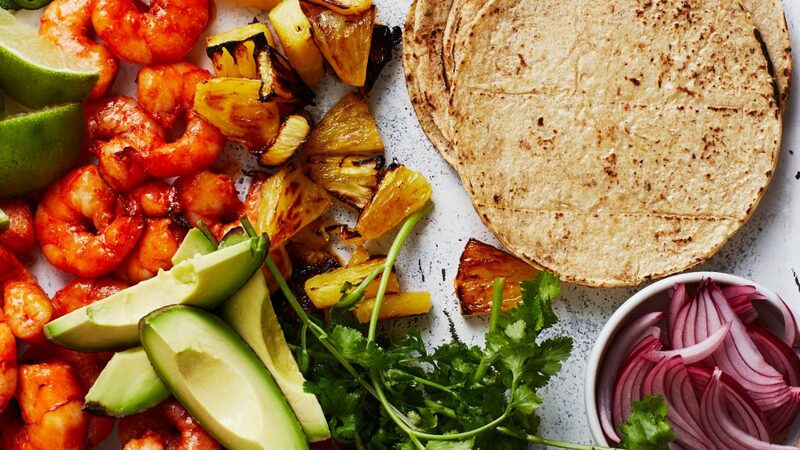 I developed these Shrimp Tacos with Pineapple for a Bon Appetit dinner column, and they are the rarest of wintry meals: substantive without being stewy; deeply flavorful without being laborious; bright and vibrant without being un-seasonal. My favorite thing about it, besides the colors (look at those colors!) is how the shrimp and pineapple broil quickly on a sheet pan while the pineapple and pickled onions come together in minutes. Head over to BA for the recipe. Photo by Bobbi Lin for Bon Appetit. We made these the second we saw the recipe in our issue of Bon Appetit–they were so delicious! That makes me so happy, Libby. Thank you! 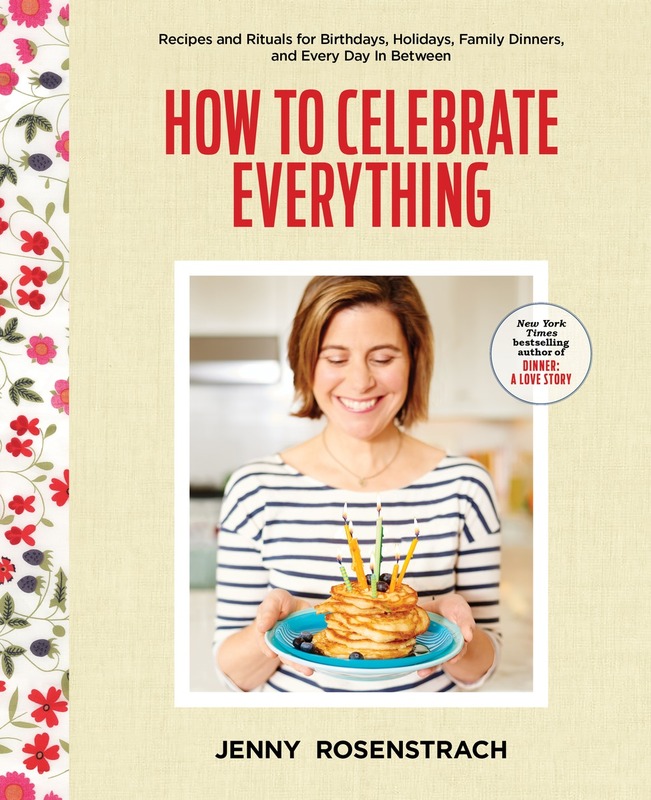 I have recently devoured How To Celebrate Everything and Dinner a Love Story. 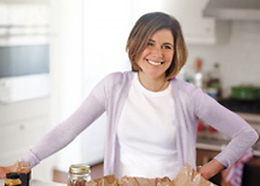 All the recipes I’ve tried are delicious, but mostly I just love your thoughts and your sweet family and your relationship with Andy! I’m so glad you’ve shared yourself with the rest of us! I’m in my usual March cooking slump where it’s hard to be inspired by tired looking vegetables in the supermarket and spring still feels a long way away. Then this recipe appeared on your blog and I felt the immediate need to make it for dinner, which I did. It came together quickly, despite interruptions to help my son with his Lego and then a Lego-related injury, and everyone loved it. It will be in regular rotation in our house. I’m already excited to try this on the BBQ this summer. I have a hunch that it will pair well with a patio and a G&T. Saw this recipe today and made it for dinner! My family loved it! Thank you! This was amazing. I thought it looked good, but was even better than I expected. I immediately sent an all-caps text to my sister telling her that even though she was skiing, she had to find the ingredients in the store in town and make it in her rental tonight. Shrimp is not my favorite thing in the world, but I’m willing to give it a chance ’cause this recipe just looks amazing! Thanks for sharing! I loved this recipe. It can delight everyone on dinner table i just went through the recipe and you made this marvelously. Shrimp tacos with pineapple, idea is really exceptional. Pictures itself say how toothsome this is. I am looking forward to make this for dinner. Thanks for sharing ingredients. According to my teenage daughter who is just getting her feet wet in the cooking department and made them for her family dinner shift last week – these tacos were “lit’ – delicious and so easy. She had them ready for all of us when I got home from work! I can attest to the delicious and they must have pretty fast and easy as I didn’t get a text with a question or catastrophe while she was cooking. Awesome recipe but even more awesome are your posts. 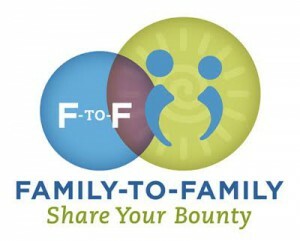 Thanks for bringing humor and commonsense (and cocktail recipes) to the daily battle of what to serve for dinner! I made this for Sunday dinner yesterday. It was delicious. The whole family enjoyed it. The combination of sweet, salty and spicy was right on point. This is going in my binder of regular recipes.